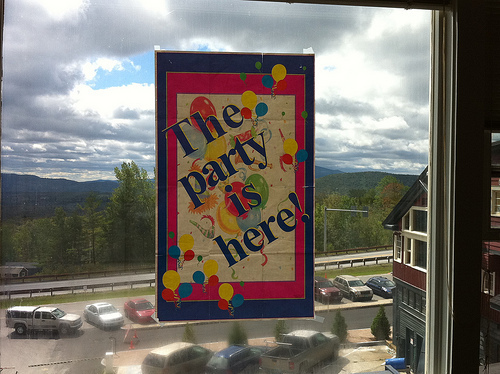 Having a party at home is economical compared to the expense of a banquet hall. However, it doesn’t always make sense to have some parties in a house. First birthday parties are such wonderful occasions. Unlike other birthday parties, they are usually large gatherings and require extra planning and money. Here are 8 practical reasons why having a 1st birthday at an alternate location makes sense. Food preparation: Hosts around the world ask themselves this question,” What do I serve the 40-60 coming to the party?” Most of us have not had a reason to cook for a large group or prepare a large amount of food. Should I cater the party, or cook a meal? If you chose to cater, it is costly. If you cook the meal, do you have time for all the work that’s involved? Do you have space and equipment to do it efficiently? Parking space: Some hosts will hire a valet service that will park the cars around the neighborhood. Others will leave it up to their guests to fend for themselves and drive around the neighborhood until they find parking. However, when you invite 35 or more people to a party, figure that at least one half of them will need to find a parking spot. Can your neighborhood handle the extra parking? Rubbing shoulders with Uncle Bob: An intimate setting is nice, but when large numbers of people are moving around, it is no longer intimate, but confining. Where are all your guests going to sit? Will they need to sit to eat? Will they be able to take part in all the activities? Cleaning the house: Having a one-year-old in the house is a lot of work, and having to clean it from top to bottom is a lot more work. The advantage of having a party at another location . . . it’s already clean. A house is cozy, but is it the right atmosphere? If you are looking to create an atmosphere that “wows” the guest, most homes don’t have that oomph. Banquet halls and restaurants create an atmosphere that most houses just cannot achieve. I’m not an octopus: Trying to be a host, parent, and server at a party is impossible. Have the event at a banquet hall or restaurant and you have help to serve, clean, and assist you with all your party needs. No clean up: Unlike having a party at home, once the party is over, you leave. No cleaning, no worrying about putting food away. Just gather your stuff and walk out the door. Will you leave already! Every family has that one person who has no place to go and wants to spend the entire evening sitting, watching TV, playing video games, or just hanging out. As much as you enjoy that person’s company, it’s been a long day. All you want to do is relax in your own home and that means……all party guests must leave.